Tree from Brady et al 2006. I see that the TimeTree of Life project is now public. This collaborative project draws on the research of dozens of biologists to estimate the timing of past evolutionary divergences. The work is available as a book, but the online version has an interactive section that allows the user to name two organisms and get back the date the two last shared an ancestor. A word of caution, though. While the output is extremely precise (i.e., it gives exact dates with decimal places), precision is not necessarily accuracy. The given dates are really the midpoints across a range of estimates, and for appropriate scientific caution you’re still best off consulting the referenced papers themselves. In our insect example, the work was done by the Smithsonian Institution’s Seán Brady. Still, it’s a fun little tool. I saw this short video at a conference last year and was entranced. The clip shows how the ancestral arachnid body plan changed as it evolved through various descendant lineages. 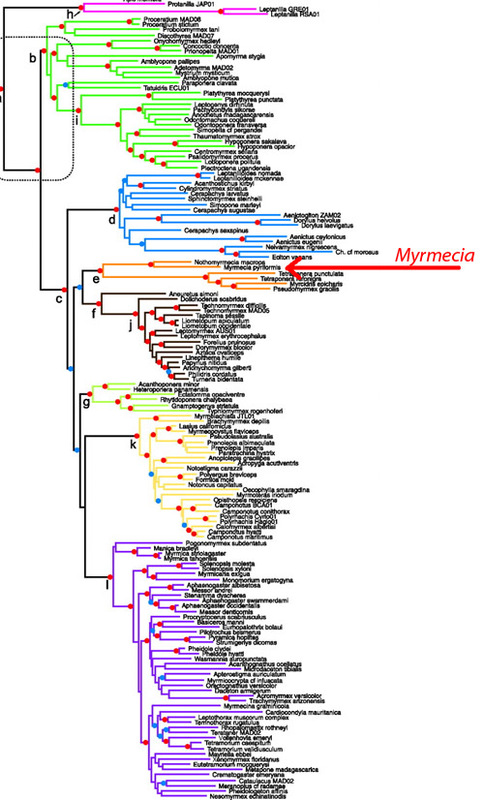 I’ve just started a project in collaboration with Daniel Kronauer, Jack Longino, and Andy Suarez to infer the phylogeny of species in the Neotropical ponerine genus Simopelta. If you happen to have any DNA-quality specimens of these unusual ants in your keep, we’d greatly appreciate a donation. Why Simopelta? 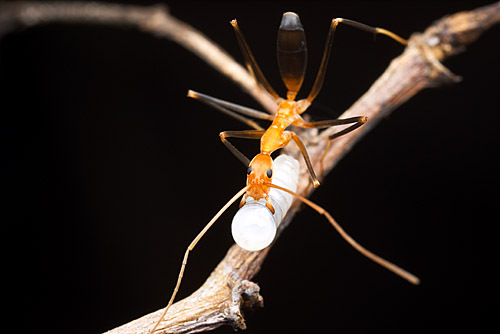 These insects are among the “other” army ants, the barely-known lineages that have also evolved the specialized nomadic lifestyle that characterizes the well-known, photogenic, and oft-televised ecitonine and doryline army ants. Yet Simopelta are ponerines, a completely different subfamily of ants. Because they acquired their traits independently, Simopelta will add power to statistical tests of various hypotheses about how army ants came to be. That, and they’re really interesting critters in their own right. Explaining the evolutionary tree of life is always a tricky proposition, as narratives are inherently linear but evolution spirals outwards in countless messy directions at once. To tell a story from the tangled bank requires picking a single thread and following it, yet it is precisely our tendency to follow single threads that causes so much misunderstanding of how evolution works. Attenborough grapples with the problem using an animation that permeates the video, showing graphically the complexity of an ever dividing tree in the background as he traverses time from ancient to modern. Yet I don’t think he is entirely successful. The problem is that the story he tells is the same one that’s always told: the vertebrate descent from early chordates to primates. There is lip service paid to other lineages, but probably not enough. The more the same vertebrate story is repeated as the preferred exemplar of evolution, the more we reinforce the incorrect ladder-like narrative of linear evolutionary progression. The same sort of video could be made that ends at sea cucumbers, or rotifers, or grasses, and it would be every bit as accurate as the same old primate one that we see again and again.